I previously posted about Speech Buddies, the innovative, FDA-Approved and research-supported devices that assist clients with tongue placement for accurate articulation of /r/, /l/, /s/ and /ch/ and /sh/- sorry, I am not bothering with IPA here! 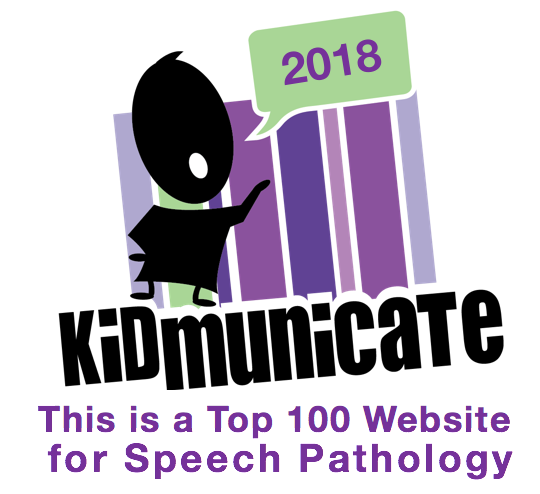 I have been using Speech Buddies with several cases at my school and was excited to be given the opportunity to preview their new FREE website available to clinicians, families, and kids. The new website allows clinicians additional opportunities to "connect" with clients and families through a controlled social interface. Through these features, clinicians can assign various exercises and also generally communicate easily with parents to report results or give feedback. I tested out the therapist portal which consists of a dashboard in which you can enter all of your students who are currently using speech buddies as part of their articulation program. By selecting students, you can view recent activities and results, and elect to complete more exercises with the particular student. When doing so, the student is presented with 10 stimulus words (you can select phoneme, word position and difficulty level, and whether the child is practicing with or without the Speech Buddy). While the student is practicing, you can keep data with the student by marking their production "Great!" or "Keep Trying!" At the end of the exercise, the results are entered into the students online record for you to refer to when needed. Overall, it's a simple interface that therapists (and students- as they can practice at home!) will find easy to use. You can register for Speech Buddies University as of today and the login is free, so check it out. BONUS- This website works GREAT on the iPad in your Safari browser!!! Speech Buddies look like a great idea but at $149 each or $300 for the set, they are a very pricey for my little private practice. Do you think they are really worth it? I am seeing good results with the few students I have used it with, with the students establishing the sounds more quickly. You'll have to decide though! Also, keep in mind that if you buy one set, that's all you need. They can be sanitized and reused and you can encourage the parent to purchase one for home practice, as it may save them money in the long run over additional sessions with you. I'm happy I located this website! From time to time, students want to cognitive the keys of productive literary essays composing. Your first-class know-how about this good post can become a proper basis for such people. thanks! Announcing the Essential Tech For SLPs Website!